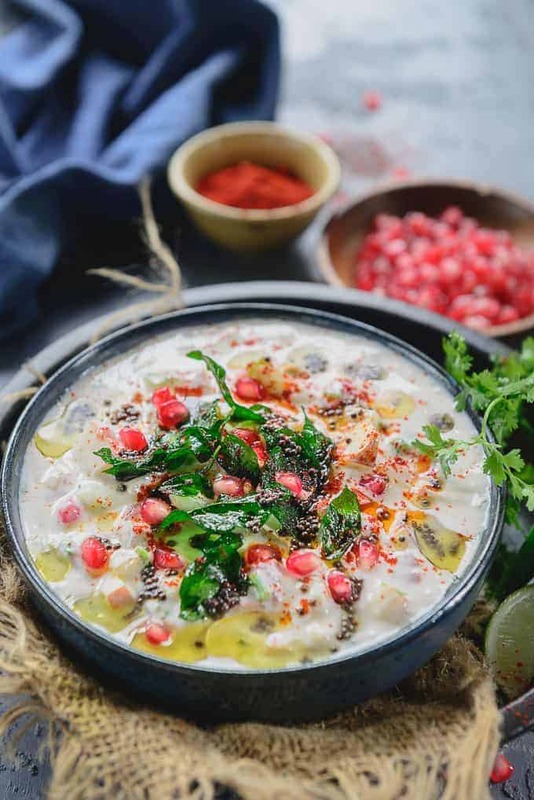 Fruit Raita is a delicious and healthy dip that is prepared with yoghurt and diced fresh fruits, both great for digestion and packed with nutrients. Here is how to make Fruit Raita Recipe. 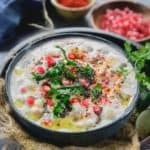 Fruit Raita is a delicious and healthy dip that is best had along with a meal or whenever hunger strikes. This yummy dip is prepared with yoghurt and diced fruits, both great for digestion and packed with nutrients. 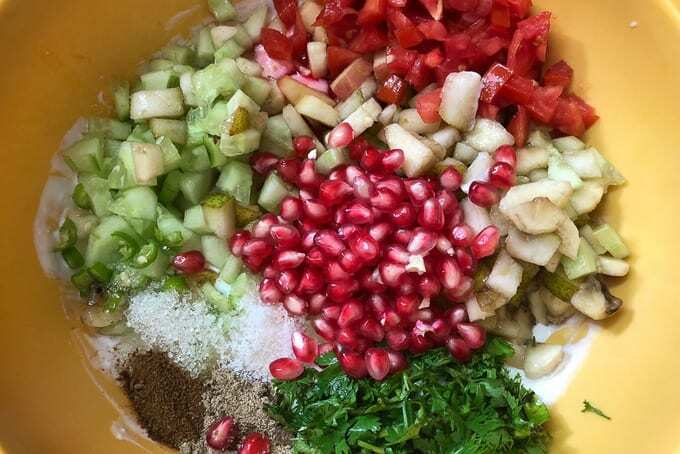 Fruits such as banana, pomegranate, pear, strawberry, pineapple, cherry, orange and apple can be added with cucumber and tomato and mixed with Indian spices to give it a unique twist. Tempering the yoghurt adds a different flavor altogether. I have added a little bit of Rooh Afza, a rose syrup which gives a peculiar taste to the raita. You can also add some diced boiled potatoes and onion to this raita. Tempering is optional. You can serve it without tempering too. This raita is a great way to include healthy fruits in your kid’s lunchbox or into their snack times. Vermicilli Raita, Boondi Ka Raita and Kaddu Ka Raita are also prepared along similar lines. Cut the fruits only when you are ready to add them in the raita. 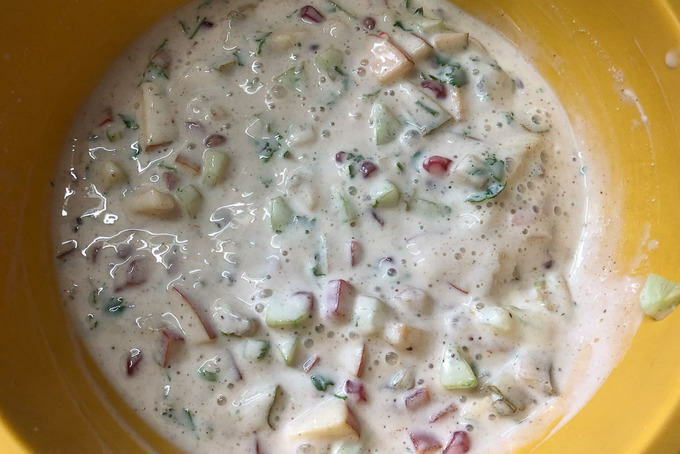 If making this fruit raita beforehand, do not salt and sugar to it. Add these two ingredients only when you are ready to serve. Otherwise the fruits will leave water and make the raita thin. 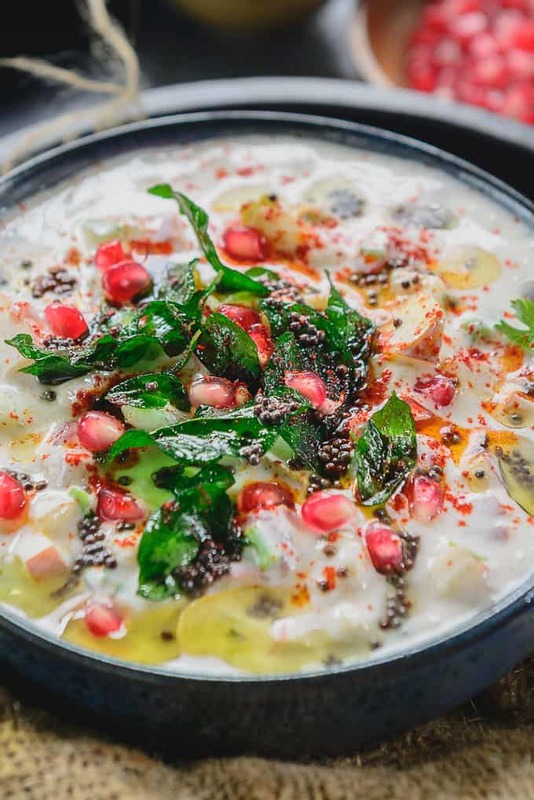 This raita tastes best when made using fresh fruits. Canned fruits do not give it a very nice taste. Use seasonal fruits to make this raita. Adjust the amount of sugar and salt according to your taste. You can choose to skip tempering over the raita. 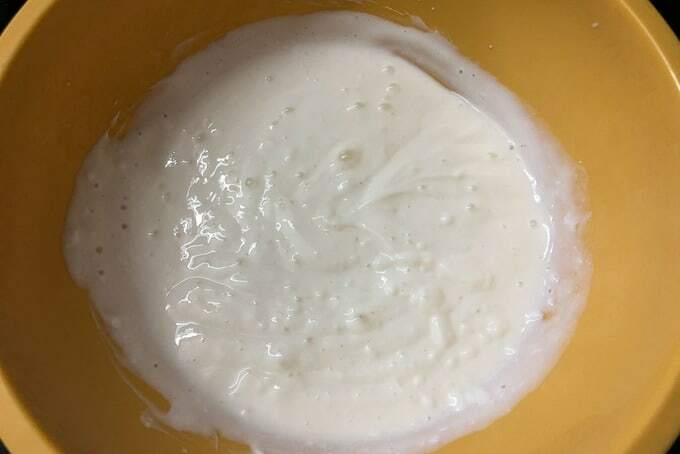 Whisk fresh yogurt till smooth and creamy. Add little milk if the raita is too thick. For tempering, heat oil in a pan. 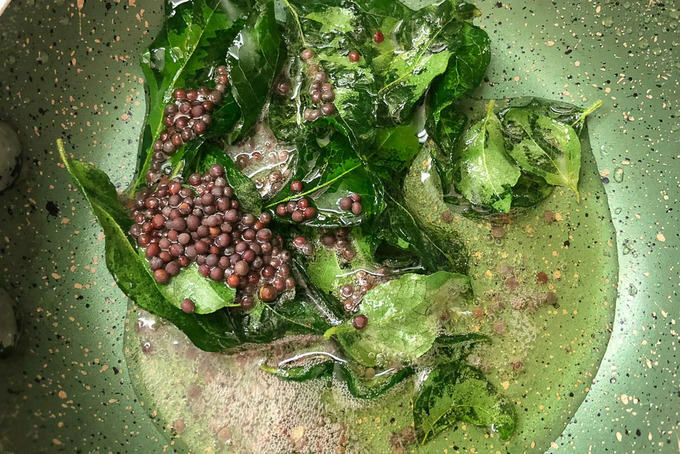 When the oil is hot, add mustard seeds and curry leaves. Let them crackle. Pour the tempering over the raita. 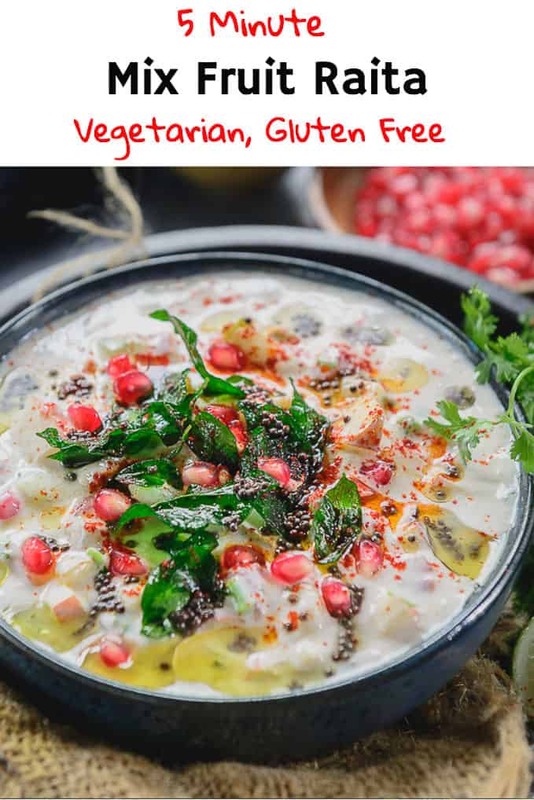 Fruit Raita is a delicious and healthy dip that is prepared with yoghurt and diced fruits, both great for digestion and packed with nutrients. Here is simple recipe to make Fruit Raita. Pour the tempering over the raita. Love the color. I don’t know what to think about adding the green chili but will definitely try this one out! Thnx. You can skip adding green chilli if you not like it’s taste.